Marlin Fishing Barra: Barra has long been a world renowned marlin fishing destination. The first grander caught in Mozambique was taken just around the point at Coconut Bay. The waters drop off to 60 and 80m and more, quite sharply, a few kilometres off Barra, and along this drop-off the closer marlin grounds are. Live bait – tiny little yellowfin, and bonito are quite easy to find and swim live. And whilst looking for these desireable baits, we fish a spread designed by Captain Duarte Rato – a few monster chuggers and some inbetweeners allow for a diverse offering covering marlin, sailfish and the bigger tuna and wahoo that often frequent these waters. Further out to sea is the deep purple Mozambique Current. This is wild country and sometimes we can have 7 or 8 hookups a day. 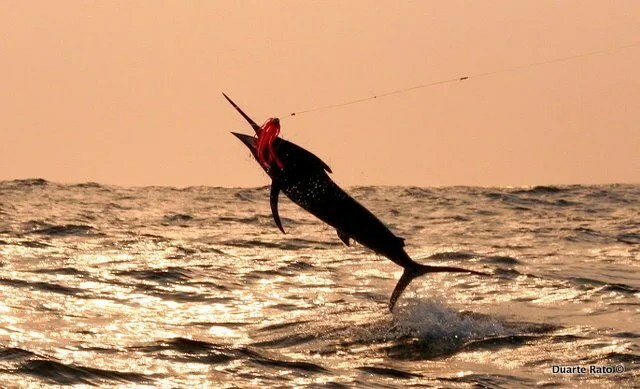 This is marlin fishing Barra style! We do not fish light tackle, and push the drags in order to get a good, healthy release. All our billfish are released. Boats are 6 to 8m or so, some bigger – with all the expected amenities and facilities. Dry launching and a close run to the marlin waters, make it very comfortable. When the sea is up, we can fish inshore protected waters for the same fish really – striped marlin love the Barra Bay waters. The day includes tackle and refreshments…lunch can be catered for…the boats are big and stable, and can handle a crowd. Please contact Sean on umzimkulu@gmail.com to make arrangements. The long walk to freedom…Barra is great marlin fishing territory, just down the coast from Bazaruto Island.